30 Inch Highboy Cocktail Round Stretch Spandex Table Cover White - Your Chair Covers Inc.
30 inch Spandex Highboy Cocktail Table Covers in White. 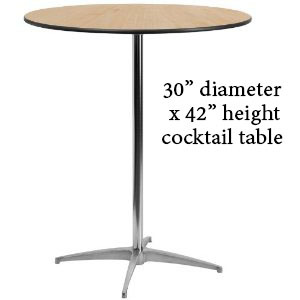 Stretch Tablecloths for 30" x 42" Round Top Cocktail Tables or Bistro Tables. Made from high quality four-way stretch spandex material, our white stretch spandex 30 inch round highboy cocktail table covers exemplify modern sophistication and luxurious elegance. They are designed to fit 30" round highboy tables with 42" height at weddings, casinos, hotels, restaurants and other special events. White spandex highboy tablecloths from Your Chair Covers feature deep canvas foot pockets, are durable, do not require ironing and can be laundered countless times. CARE INSTRUCTION. Machine washable with water (cold or room temperature) in gentle cycle. Use normal detergent. Bleach is fine and we recommend following the usage instructions on the container. Don't wash with other materials. Wash like colors together. Tumble dry with low temperature. Avoid overloading the machine and make sure that both the washer and the dryer are in good working order. Gradually dry in dryer to avoid temperature shock. Good product at a great price! We have purchased more expensive spandex covers, but had difficulty getting stains out of the white. No issues with this fabric. Quick shipping from CA to FL and their customer service is top notch. The product was exactly what I order and it was delivered very quickly. the covers were perfect in all ways! I am very impressed with the chair covers quality. This is my first time on this site and I was pleased with the speedy shipping also. Nice thick fabric, quality stitching, and pockets for the table legs. FABULOUS PRODUCT. FABRIC APPEARS TO BE A GREAT QUALITY. Couldn't be happier! They are Perfect! "They works perfectly in 32"" round bar table! I put light inside and the were so cool!!! Fast delivery and excellent customer service online chat!"